powerskating: develop proper skating techniques including forward stride, cross overs, tight turns, backwards stride, balance and explosive power. 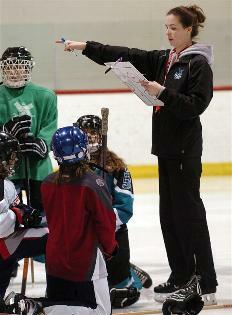 spearing & passing: ring possession is key in ringette. Help your players develop the accuracy needed for forhand and backhand passing, as well as tips to improve their spearing percentage exponentially. powershooting: learn to take advantage of your opportunities, and to create new ones for yourself! From the fundamentals of shooting on the ice, backhand, wrist shots to driving to the hot spot and racing the goalie to guarantee yourself an open net. goalie development: with a new generation of shooters on the loose, don’t leave your goalie unprepared. Quality goalie instruction that focuses on basic positioning, agility, balance, ring distribution with the glove and the stick, save recovery and rebound control. defence clinics: often forgotten about at practice, a strong defensive core can be the difference in big games. Playing defence requires particular skating skills, thinking ahead and playing smart. Help your triangle work flawlessly and give your defence the edge in one-on-one situations. game analysis: need help figuring out why you can’t break out of your zone? Lost for ideas in the offensive zone? Here’s an opportunity to have an experienced coach and long time ringette player come and watch your team play and give you feedback and suggestions on how to improve their overall game.